Jeanine and Jack write the beloved (mostly) vegetarian blog, Love & Lemons and their 2nd book just came out! Jeanine used to work as a graphic designer before blogging full-time, and it sure shows. The fonts and graphics in the book are so beautiful! Their new book, Love & Lemons Every Day : More than 100 Bright, Plant-forward Recipes for Every Meal is exactly how I like to eat. There are so, so many good ideas (Moroccan Spiced Carrot Salad with Lentils! Zucchini Verde Vegan Enchiladas! Sweet Potato Wedges with Farro & Tahini!) 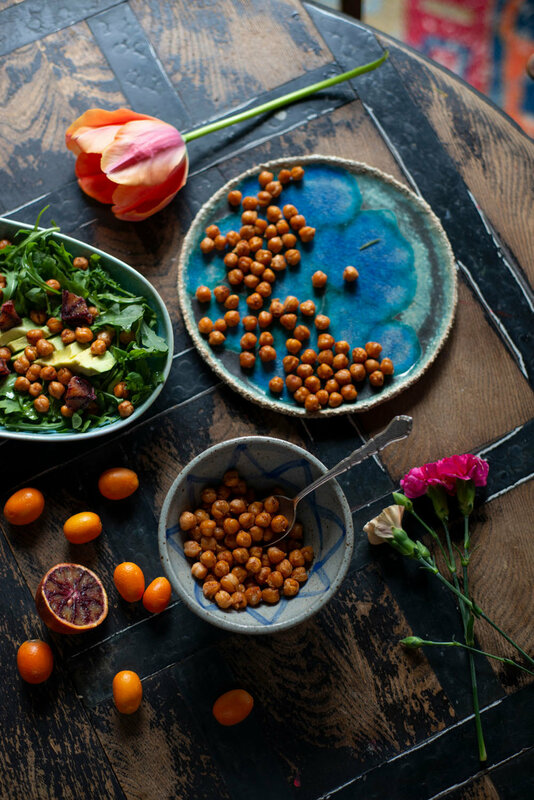 , but I chose one of the simplest ones, Roasted Chickpeas, to make this week from the “Homemade Extras” chapter in the back of the book. This recipe has just 3 ingredients, and is easily adaptable. You can include them on the side of a cheese plate in place of nuts, or add them on top of any dish for a little extra protein. I made extra and am keeping them in the fridge to throw on salads all week. Recipe below…congrats Jack & Jeanine!! Preheat the oven to 400˚F and line a baking sheet with parchment paper. Place the chickpeas on the baking sheet and toss with a drizzle of olive oil and sprinkles of salt and pepper. Roast 20 minutes, or until crispy. Remove from the oven and toss with the smoked paprika, if using. Erin’s notes: I used canned chickpeas to save time and I just used paprika. They also suggest you can toss afterwards with cayenne or curry which I will try next time! Disclosure: I was gifted a copy of this book by the authors and their publisher. Thank you! Also–The Forest Feast uses affiliate links and may make a small profit if items are purchased via links on this site.